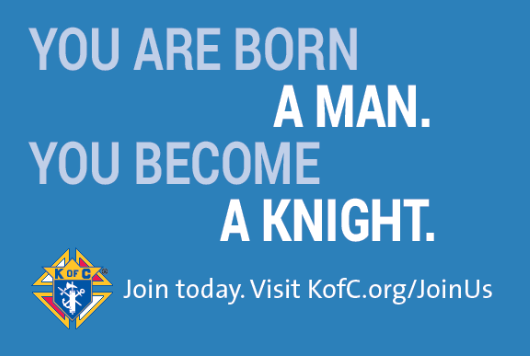 “Strengthened with power through His Spirit” is the theme for the 7th Annual Catholic Men’s Conference and the Maine State Council Knights of Columbus are co-sponsoring the event. It is scheduled for Saturday 13 Oct 2018 at the Immaculate Conception in Portland. Faith Director Bob Dumond has been working diligently with the Core Team led by Father Dan Greenleaf and his brother Ken Greenleaf for the past couple of months. Special $30 rate for teens & young adults age 16 – 22 and $50 for those ages 23 or older. Cost includes lunch. The Diocese of Portland invites all Catholic men ages 16 and older to the 7th annual Maine Catholic Men’s Conference which will feature a closing Mass celebrated by Bishop Robert P. Deeley and presentations by Father Nathan March, pastor of Holy Savior Parish in Rumford; Deacon Harold Burke-Sivers, a dynamic Catholic evangelist, radio host, and bestselling author; and Dr. William Martel, a member of Good Shepherd Parish in Saco, who was a Protestant theologian before becoming a member of the Catholic Church.